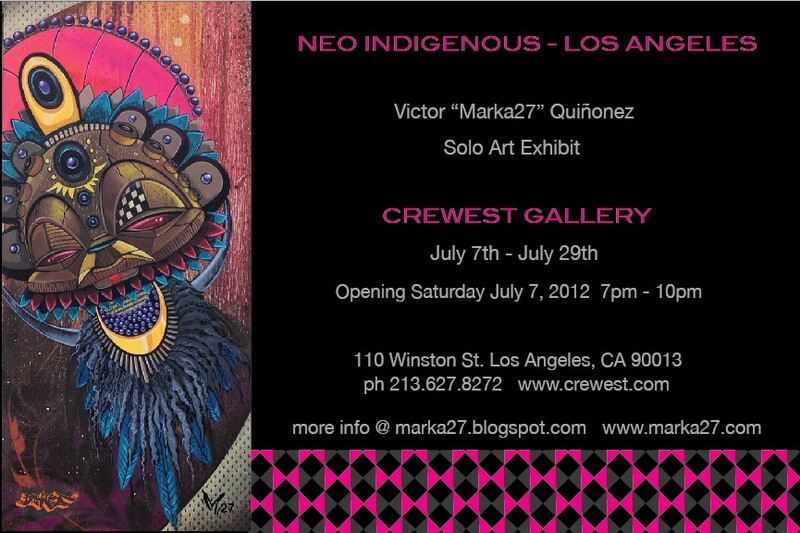 Victor "MARKA27" Quiñonez brings his critically acclaimed new body of work, Neo Indigenous, to the City of Angels on Saturday, July 7, 2012, from 7-10pm. Hot off the heels of his packed-house New York City premiere, MARKA27 indulges Angelino tastemakers at Crewest Gallery (110 Winston Street, Los Angeles, 90013) with his newest mix-media exhibit. From July 7 - 29 art lovers will journey through the artist’s exploration of binding ancient Aztec, African, and Asian art forms with modern pop culture and street art. Neo Indigenous celebrates Marka27’s highly-anticipated return to Los Angeles. Representing a shift in the artist’s cultural consciousness, Neo Indigenous embodies Marka27’s quest to bridge past with present, illustrating his yearning to bring deeper meaning to both old and new art forms. By juxtaposing ancient elements with contemporary design aesthetics, Marka27 reveals both a connection and a disjuncture in the process. Challenging viewers to confront the existing practice of commodifying art, the exhibit leaves a lasting impression-- a mark Marka27 has predicated his reputation on. Using multiple mediums such as paintings, collectible vinyl toys and speakers, silk screen panels, and prints, Neo Indigenous is a sensory feast of the artist’s ability to float seamlessly between varying art forms. As a special treat and tribute to a city he once called home, never-before-seen works will be unveiled and the artist himself will create a live installation piece. Having worked with clients such as Pioneer Electronics, VH1, Disney, Scion, and Kidrobot, Marka27’s LA premiere is the go-to event of the summer! Born in Juarez, Mexico, and raised in Dallas, Texas, Victor “Marka27” Quiñonez’s foray into the art world began in the city’s streets mastering the art of graffiti. Advancing to earn his BFA from The Museum School of Fine Arts in Boston, MA, Marka27 became a household name for his “audio canvas” series and elaborately executed installation art and murals. Marka27's artwork has been exhibited in galleries across the United States and showcased alongside artists such as: Futura, David Choe, Ron English and Gary Basemen, and has appeared in lifestyle magazines and books such as Graffiti Planet, Burning New York, I am Plastic Too, and gracing the cover of Flux-Designer Toys. His artwork has sold through the world-renowned Freeman's Auction House. Now based in New York City, Marka27’s quest for artistic exploration continues. Breaking beyond the canvas’ confines, he created to critical acclaim the MIniGods: Givers of Divine Sound©, a high-end line of designer vinyl toy speakers. His latest body of work, Neo-Indigenous© is a deep look into indigenous ancient aesthetics fused with street art, pop culture, and personal life experience.